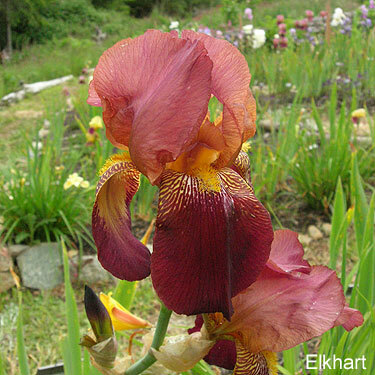 'Elkhart' (E. G. Laphpam, R. 1936). TB. Late midseason bloom. Color Class R9D. Pleasant fragrance. 'King Tut' x 'Ethel Peckham'. Lapham 1936, Cooley 1937.
jpg IMG_7360.jpg manage 322 K 21 Dec 2018 - 00:02 Main.davepote Photo by David Potembski, Presby 2016, Bed location 28-50.
jpg IMG_7804.jpg manage 365 K 21 Dec 2018 - 16:01 Main.davepote Photo by David Potembski, Presby 2016, Bed location 28-50.
jpg IMG_7806.jpg manage 578 K 21 Dec 2018 - 16:06 Main.davepote Photo by David Potembski, Presby 2016, Bed location 28-50. JPG elkhart01.JPG manage 675 K 10 May 2018 - 21:57 Main.TLaurin Photo by Nancy McDonald-The Pickle Barrel Collection. JPG elkhart02.JPG manage 649 K 10 May 2018 - 21:59 Main.TLaurin Photo by Nancy McDonald-The Pickle Barrel Collection. JPG elkhart03.JPG manage 547 K 10 May 2018 - 22:01 Main.TLaurin Photo by Nancy McDonald-The Pickle Barrel Collection. JPG elkhart04.JPG manage 700 K 10 May 2018 - 22:03 Main.TLaurin Photo by Nancy McDonald-The Pickle Barrel Collection.